Caroline is offering a giveaway of her first novel Coffee Tea The Gypsy & Me which is the first novel featuring characters from all the books. To be in the draw, just comment below. The winner will be drawn Thursday April 5th. Welcome to Café Cala, Caroline. 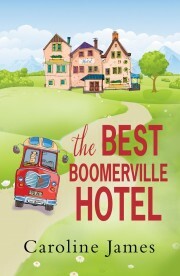 I really enjoyed The Best Boomerville Hotel and the fact that, like me, you choose to write about mature characters. in literature and in films and TV and their popularity appears to be on the up. a publisher for this book? dreamed of when I started writing. see the world through rose tinted glasses but I’m working on that. situations and love a good laugh. If your book was made into a film, who would you like to see star in it? Lisa Riley, a brilliant actress who could bring Hattie to life. Hotel. Did you have that in mind when you wrote it? How heavily do you draw on your own experiences in your writing? Benjamin, Clare Mackintosh and Joanna Cannon. getting a hug from my mum. have a life of their own once I start writing. perhaps in a café or while family life buzzes all around, but I can’t. of craic and wonderful Irish hospitality. on your wonderful blog. I so enjoyed answering your interesting questions. 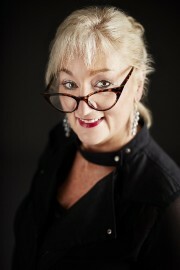 The Best Boomerville Hotel is a rollicking tale featuring a motley of larger than life characters thrown together in a hotel catering for lonely people in midlife.It;s full of feel good, down to earth characters and English humour and has been described as described as Britain’s answer to The Marigold Hotel. I would love to win this signed book. I love to read and will leave a review on both Amazon and Goodreads when I finish. Hoping to win. Thanks for giveaway. It’s great to meet a new author. More books to read!! What a cute cover for the book! I look forward to reading this story. I’m thrilled that there’s finally a genre for older readers. Thank you. Looking forward to reading Caroline James books, they sound exciting and fun, heading to the library now! Awesome!! Looking forward to reading Caroline James books, sounds like an exciting and fun read, heading to the library now! Awesomeness!! Caroline James is a new author to me and I always love to discover new authors. I especially enjoy reading humorous books after a long day at work. I also like how your characters are older. I can relate to them more. I would love a copy of your book! This sounds like just my cup of tea! Admire your tackling mature subject matter. We can all relate to your stories and bond together. Thanks. Thank you Maggie for introducing another author who writes for mature readers. Sounds like a fun book, can’t wait to read it. Looking forward to reading Caroline James books. They sound delightful and so fun. She is a new author to me and I love that she has older characters in her books.